A Giant Pulsating Mind is a Terrible Thing to Waste. This is the famous Mars University, founded in 2636, with several mottos including "Knowledge Brings Fear" and "A Giant Pulsating Mind is a Terrible Thing to Waste". 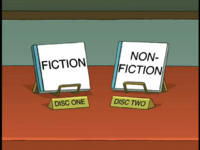 Mars University has the largest library collection in the western universe (namely two optical discs: one for "Fiction", and one for "Non-Fiction"). Its organization and premises resemble modern universities quite a bit (fraternities, traditional college foliage, acceptance of students in exchange for donations, etc). Professor Farnsworth teaches the "Mathematics of Quantum Neutrino Fields" class, while Amy is one of the students. The University students are alien, humans and even robots. During the "Mars University" episode Fry enrolled in order to become a certified college drop-out once more. 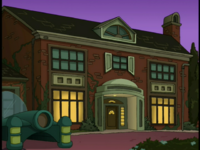 As well as, Bender said to have previous studied here and returned to steal and trash the school once more. "The Mathematics of Quantum Neutrino Fields"
Name Reference: Err is also a computer message, an abreviation for "error"
Description: The fraternity that the fratbots belong to, it is known as the nerdiest fraternity on campus. 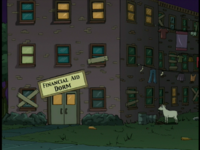 Description: The dorm where Fry and Guenter stay during their tenure at Mars University, the Financial Aid Dorm is clearly run down. The sign continues to fall down, and is often replaced by an even shoddier sign. Also, a goat lives near it. Name Reference: Hall's Mentho-lyptus is a brand of throat lozenge. Description: Dean Vernon's office is located in this building. Description: The building where the parents' reception is held. 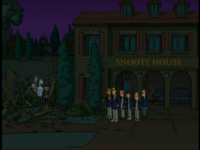 Name Reference: Although it appears as the words "Snooty House," the three O's are actually the Greek letter theta (Θ). Description: SnΘΘty HΘuse is a fraternity to which Chet and Meidermeyer belong. 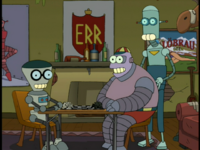 Their servants quarters is destroyed when Bender and the Fratbots fall on it from a ladder and crush it. 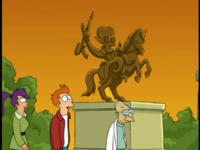 Description: There is a statue of an unspecified, ray-gun weilding alien atop a horse near Mars University's front gate. This statue reappears in "Where the Buggalo Roam". Description: This is the building where Fry, Guenter, and Amy's 20th Century History class is held. 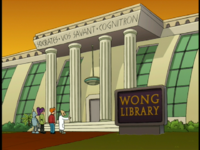 Name Reference: The Wong Library is named for Leo and Inez Wong, Amy's parents. Description: The Wong Library houses the largest collection of literature in the universe on two discs: "Fiction" and "Non-fiction." This page was last edited on 1 April 2014, at 21:03.